Cycle-making became concentrated in Birmingham, Coventry and Nottingham, where mass-production techniques had already been applied to the manufacture of textile and sewing machines, clocks, watches and handguns. Output soared and, at the outbreak of the First World War, Britain was a world leader in cycle exports. 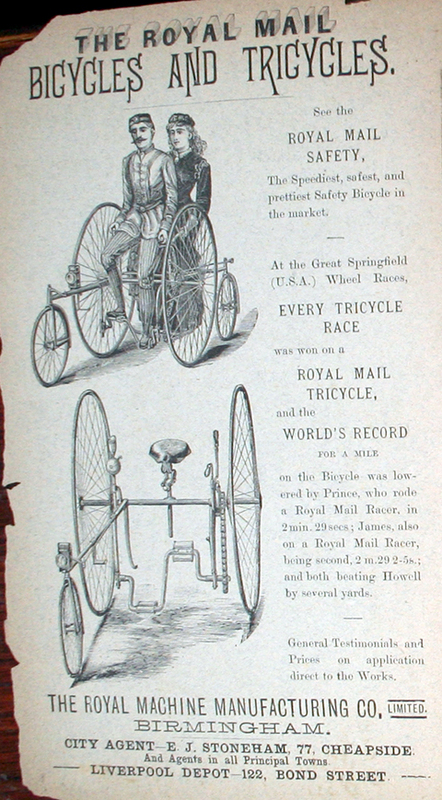 Many of the cycle companies also went on to become noted motor-vehicle manufacturers. 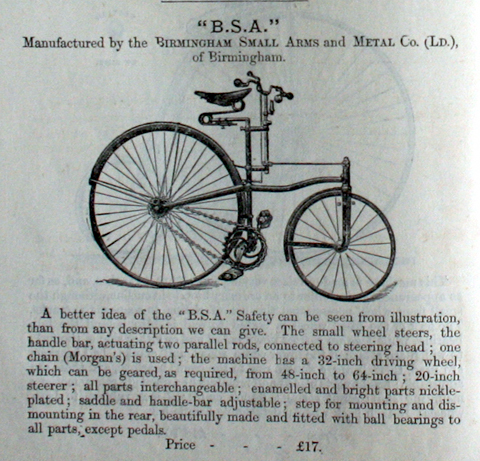 By 1900 Birmingham had the largest number of bicycle and bicycle accessory firms in the UK. Unfortunately every manufacturer who could work steel tube had tried to get into the market, either making bicycles or bicycle accessories, or both. Too many bicycle companies coupled with the new public interest in motorised transport spelt bankruptcy or a change in direction for many. By the 1930s, the Hercules Cycle and Motor Company of Aston was considered to be the largest producer of bicycles in the world. In 1802, Nelson and the Hamiltons visited Birmingham. Nelson was fêted, and visited Matthew Boulton on his sick-bed at Soho House, before taking atour of the Soho Manufactory and commissioning the Battle of the Nile medal. In 1809 a statue was erected to Nelson, by public subscription. It still stands, in the Bull Ring, albeit on a 1960s plinth. At the beginning of the 19th century, Birmingham had a population of around 74,000. By the end of the century it had grown to 630,000. This rapid population growth meant that by the middle of the century Birmingham had become the second largest population centre in Britain. Railways arrived in Birmingham in 1837 with the opening of the Grand Junction Railway which linked Birmingham with Manchester and Liverpool. The following year the London and Birmingham Railway opened, linking to the capital. This was soon followed by the Birmingham and Derby Junction Railway and the Birmingham and Gloucester Railway. These all initially had separate stations around Curzon Street. However in the 1840s these early railway companies had merged to become the Midland Railway and the London and North Western Railway respectively. The two companies jointly constructed Birmingham New Street Station which was opened in 1854, and Birmingham became a central hub of the British railway system. In 1852 the Great Western Railway arrived in Birmingham, and a second smaller station, Snow Hill was opened. The GWR line linked the city with Oxford and London Paddington. Also in the 1830s, due to its growing size and importance, Birmingham was granted Parliamentary representation, by the Reform Act of 1832 initially with two MPs. Birmingham was one of the first new towns to be incorpoated as a municipal borough by the Municipal Corporations Act 1835, in 1838. Birmingham’s growth and prosperity was based upon metalworking industries, of which many different kinds existed. Birmingham became known as the “City of a thousand trades” because of the wide variety of goods manufactured there – buttons, cutlery, nails and screws, guns, tools, jewellery, toys, locks, and ornaments were amongst the many products manufactured. For most of the 19th century, industry in Birmingham was dominated by small workshops rather than large factories or mills. Large factories became increasingly common towards the end of the century when engineering industries became increasingly important. The industrial wealth of Birmingham allowed merchants to fund the construction of some fine institutional buildings in the city. Some buildings of the 19th century included: the Birmingham Town Hall built in 1834, the Birmingham Botanical Gardens opened in 1832. the Council House built in 1879, and the Museum and Art Gallery opened in 1885. Birmingham became a county borough and a city in 1889. During the 20th century, Birmingham’s population continued to increase. In 1936, King Edwards Grammar School on New Street was demolished and moved to Edgbaston. The building was over 300 years old. The site was later transformed into an office block which was destroyed in the bombing of the Second World War. It was later rebuilt and named “King Edward’s House”. It is used as an office block and on the ground floor as shops and restaurants. In the First and Second World Wars, the Longbridge car plant switched to production of munitions and military equipment, from ammunition, mines and depth charges to tank suspensions, steel helmets, Jerricans, Hawker Hurricanes, Fairey Battle fighters and Airspeed Horsa gliders, with the mammoth Avro Lancaster bomber coming into production towards the end of WWII. The Spitfire fighter aircraft was mass produced at Castle Bromwich by Vickers-Armstrong throughout the war. Due to Birmingham’s industrial importance and contribution to the war effort. The city was heavily bombed by the German Luftwaffe during the Birmingham Blitz in World War II. By the war’s end 2,241 citizens had been killed by the bombing and over 3,000 seriously injured. 12,932 buildings were destroyed (including 300 factories) and thousands more damaged. The air raids also destroyed many of Birmingham’s fine buildings. In the postwar years, a massive program of slum clearances took place, and vast areas of the city were re-built, with overcrowded “back to back” housing being replaced by high rise blocks of flats (the last remaining block of four back-to-backs have become a museum run by the National Trust). Due largely to bomb damage, the city centre was also extensively re-built under supervision of the city council’s chief engineer Henry Manzioni during the postwar years. Emblematic of this was the new Bull Ring Shopping Centre. Birmingham also became a centre of the national motorway network, with Spaghetti Junction.